You are here to upgrade your Public Speaking Skills. I am here to enhance that process. 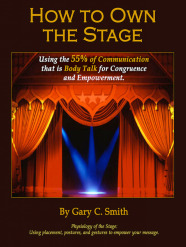 I am a former Sage trainer, an Avatar Master, Licensed Wizard, former salon owner, carpenter, contractor, professional bowler, artist, writer and currently owner of Gary C. Smith Public Speaking and Training, and training Curing SeriousitisTM. I love coaching speakers in adding content, confidence, and charisma to their presentations. Transform your Public Speaking with private coaching and group workshops. Get started with an Initial Consultation. Gary's personalized coaching handles the four components of a successful presentation: fear, congruence, content, and charisma. unlock the power in your message.